Senior Advocate and noted Jurist Ram Jethmalani lambasted the written submissions made by Advocate General Mukul Rohatgi before the Constitution Bench hearing the validity of National Judicial Appointment Commission (NJAC). He was appearing for intervener Advocate Ashish Dixit. He submitted that the Attorney General’s submission is "wholly wrong in thinking that the independence of judiciary is a qualification that comes into play only after the appointment of judges.” “Law minister is a member of the cabinet and he should not be in the NJAC as he has possess economic and political assets and thus has a tremendous capacity to corrupt people provided he corrupts himself." He added. In the detailed final written submissions filed by Jethmalani he rebutted the AG’s submissions point by point. “Every Minister in the government is party to most disputes in Court and he must not be allowed to have a vote in the matter of Judicial Appointments. The Attorney General has no answer to the criticism that the presence of the law minister in the Commission will create apprehension in the mind of a litigant who is fighting the Executive or seeking relief against illegal unconstitutional or mala fide actions of the Executive. The Law Minister with the power of the whole government and access to all its money can work wonders in getting any eminent persons' to support his choice of a Judge”. “Appointment of Superior Judges is a sacred duty and any lesser interest political, economic or a reasonable suspicion of its existence should be strictly excluded. A law Minister who has to retain power is more interested in securing votes, serving a limited constituency and doing or not doing things according to the exigencies of vote bank politics. He cannot possibly be allowed to participate and pollute this holy task”. “I am myself one who has expounded long ago the idea of National Judicial Commission but certainly not a Commission which has two laymen who may have no knowledge whatsoever of what kind of intellectual equipment, integrity and experience they should possess”. The so called 'eminent persons' must include a distinguished lawyer enjoying the confidence of the bar and the bench preferably an acknowledged jurist and second a trained Sociologist who understands the misery of the poor, the causes of poverty and legal reform connected with the grave problems of this unfortunate Nation. Other lesser mortals are not needed at all, reference to Caste and gender introduces other irrelevant consideration. “I am quite prepared to prove beyond reasonable doubt that this Act is intended only to get round the binding judgments of this Hon'ble Court in the Second and Third Judges Case of 1993 and 1998. In fact after this Hon'ble Courts decision not to refer this case to a larger bench, all further arguments by the Union of India and other Counsel appearing in support, is waste of judicial time. This whole Act is completely void and non-est because of the proposition in 4-A, slightly altered by me”. “The Second and Third Judges case cannot be reconsidered by this Bench. They are decision of a much larger bench and are binding on this Hon'ble Court. My submission is that by rejecting the reference to a larger bench as prayed for by the Respondents, without much more argument the Petitions should be allowed. The two decisions are absolutely binding”. “It is matter of surprise that the Counsel who appeared in the matter forgot all about this Article and the promises solemnly made when the Constitution was being finalised. The Bar made up for this serious lapse when it compelled the Second Judges Judgment of 1993, almost wholly by invoking the promise of Article 50. Justice Pandian's concurring judgment and even the confession of dissenting Judge Mr. Justice Ahmadi have been read by me in my earlier address to this Hon'ble Court. The Third Judges case only filled up some lacuna in the Collegium System. It is not true that the system created by these two cases did not exist in the Constitution it certainly did but was forgotten by the bar and the bench”. “The separation of the Judiciary and Executive mandated by Article 50 leads to the conclusion that Executive should have no vote in the appointment process but only a full opportunity of providing the consultee with all relevant information about the legal knowledge, freedom from fear, operation of any prejudice in favour of or hostile to one or the other litigants. It is difficult to understand what kind of new exigencies have arisen to warrant a change of the present system. Are we to take the assertion of the Attorney General as binding on this court that the character of politicians has now so improved that the Executive must have a significant role and power in the matter of appointment of Superior Judges and the so called eminent people with undefined qualifications must share the Judiciary's power of having the final and conclusive voice”. “I do not deny that some Minister may have more integrity than some Judge but this tragic paradox is part of human life. The Executive having any role in the appointment process of the Judges creates a reasonable suspicion in the mind of the Litigant fighting against the State that Judges appointed by the Executive cannot be totally impartial. Appointment of a Judge by a Minister or some bureaucrat under him prosecuting a citizen in a criminal case may well lead the accused to entertain a reasonable suspicion of judicial bias. This violates Article 21 of the Constitution which has been held to be part of basic structure of the Constitution and is subject to no restriction”. 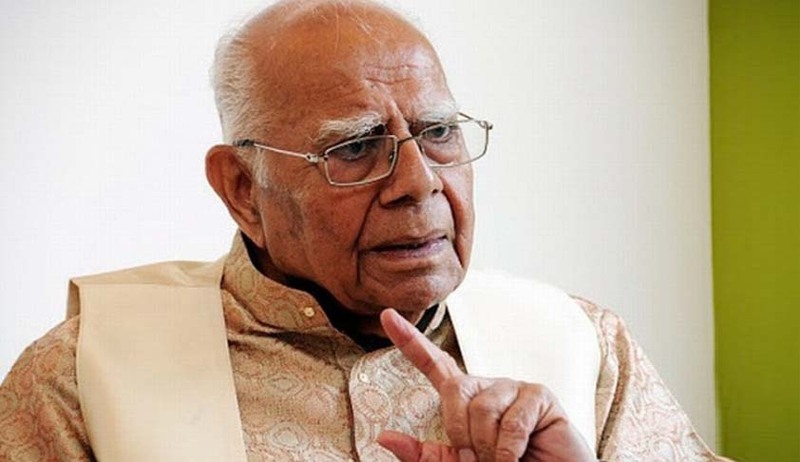 Read the full text of Jethmalani's response to AG's submission here.